Build a powerful PLC to meet the needs of every student. Based on Mike Mattos's 1-5-10 team-evaluation activity, this unscripted video will give your team the know-how to transition from a low- to high-performing team. Explore the three foundational elements to build strong teams: forming the right teams that share learning outcomes, providing dedicated time to collaborate, and collaborating professionally. 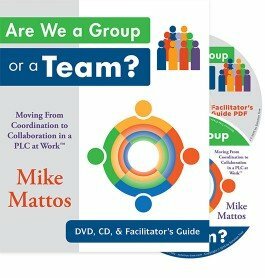 Gain advice from real PLC teams that identify the key elements of a high-performing team. Access practical activities and tools necessary to improve team function and collaboration. Explore the process for creating a 10 Team through activities provided in the Facilitator۪s Guide. Weave the short format into your busy schedule and view the video all at once, alone, or with a team.